A very popular herb available in a variety of flavors and colors. Basil is a tender herb that can be planted after last frost date. Once harvested, put in a vase of water on the counter and use as needed. Temperatures lower than 50 degrees can cause cold damage to basil and the leaves may turn brown. Available in a 2x3 inch cell. All transplants are certified organic. Select here for transplant information, pickup and order dates. Has a sweet cinnamon odor. Also known as Thai Basil. Distinctive violet stems and veining of green leaves with lavender blooms. Looks beautiful in bouquets. Often used in Vietnamese or Thai cooking. Shiny deep purple leaves make this a striking ornamental plant in the garden or in pots. Flavor is strong and is excellent in vinegars or as a garnish in your favorite meals. A very popular herb that is available in a variety of flavors and colors. 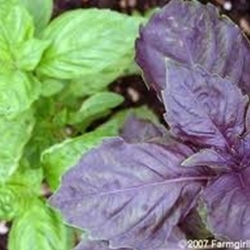 Basil is a tender herb and can be planted after last frost date. Once harvested, put in a vase of water and use as needed. Temperatures lower than 50 degrees can cause cold damage to basil. A sweet tangy basil with bright green leaves. Try it in poultry, seafood or pasta dishes. Has a zesty lime aroma. It adds unique citrus flair to fish and salads. Bright green leaves look similar to lemon basil.